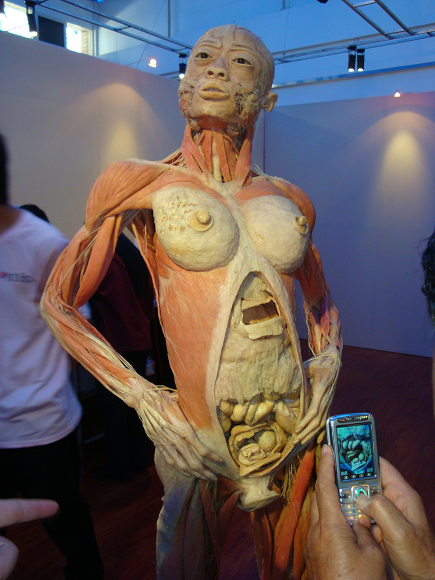 In today’s China, human body plastination has become a hugely profitable business. China is the only country where such a business has been made possible by the government. The human body plastination business started around year 2000 when the Chinese regime intensified its persecution of Falun Gong practitioners. Subsequently, the plastination industry in China thrived during the peak of the persecution. Human body plastination is a process to preserve human body or body parts by replacing water and lipid tissues with curable polymers, such as silicone, epoxy and polyester-copolymer . The only bottleneck of this process is the availability of “human cadavers.” Moreover, the plastination process requires fresh cadavers, which have not been treated with preservatives such as formalin. According to the rules of medical examination, a human corpse that is within 2 days of mortality is considered fresh . Dalian Hoffen Bio-Technique Co., Ltd. (referred to as “Dalian Hoffen” in this report), located in Dalian City of China’s northeastern province of Liaoning, was founded in 2004 when Bo Xilai was Governor of Liaoning Province and the Deputy Chief of the Provincial Party Committee. Dalian Hoffen is a “human body plastination” factory utilizing solely Chinese bodies. The General Manager of Dalian Hoffen and Director of Department of Anatomy at Dalian Medical University, Sui Hongjin  once claimed that some “cadavers” were from the Public Security Bureau, and that the reason Dalian Hoffen could become “the largest human body plastination factory in the world” was due to the “caring and support” from “government officials of various levels.” In fact, many Chinese Communist Party (CCP) officials and government agencies have been involved in one way or another in the plastination business. According to the “Regulations on Dissection of Corpses” issued by the Ministry of Health on Feb. 22, 1979, if a human corpse remains unclaimed for at least one month, it is deemed “unclaimed” and can be used for anatomy studies by medical schools. In order to use the corpses, medical schools must obtain permits from relevant government agencies or the Public Security Bureau. The “Regulation” has been implemented by the Ministry of Public Security. In order to keep the “unclaimed” bodies suitable for anatomy studies after one month’s wait time, the bodies must be treated with preservatives. Otherwise, within 10 to 23 days after death, the corpse will have only hair, skin, bone and cartilage left . The following are some examples of such “fresh corpses” in use for plastination purpose. A 2005 research report by Shandong Province Weifang Medical College Department of Anatomy said, “take fresh adult corpses with no external wounds and pathological changes, inject 8,000ml formalin through the cerebral arteries, then inject silicone … ” What could be the cause of death of those corpses “with no external wounds and pathological changes”? A 2006 research report by the People’s Liberation Army Lanzhou Region General Hospital said, “choose 8 male corpses of ages between 25 and 40 with good teeth structure; take the heads and dissect them into 8cm x 8cm x 10cm specimens …” The report was a program of National Natural Science Foundation of China . When asked about the source of the bodies used in his plastination factory in Dalian, Sui Hongjin  answered, “The bodies were used by medical schools for anatomy study. The medical schools obtained the bodies as ‘unclaimed corpses.’ ” However, those bodies were plastinated in Sui Hongjin’s factory within hours, not exceeding 2 days, of death. The bodies were indeed unclaimed or it might be that the bodies were not even allowed to be claimed. Where did Sui Hongjin get so many “fresh bodies” to support the lucrative plastination business? In 2004, the German news magazine “Der Spiegal” obtained evidence  confirming that in the “fetus and infant database” maintained by the Von Hagens Plastination factory in Dalian, there was a detailed record of a 9-month-old fetus labeled 01BR01. The male fetus arrived at the factory on March 26, 2001. His nationality was “mainland China” (Inlaendich). His origin was clearly written as “Public Security Bureau.” How could a 9-month-old fetus end up in the Public Security Bureau? This exhibit displays human remains of Chinese citizens or residents which were originally received by the Chinese Bureau of Police. The Chinese Bureau of Police may receive bodies from Chinese prisons. Premier cannot independently verify that the human remains you are viewing are not those of persons who were incarcerated in Chinese prisons. This exhibit displays full body cadavers as well as human body parts, organs, fetuses and embryos that come from cadavers of Chinese citizens or residents. With respect to the human parts, organs, fetuses and embryos you are viewing, Premier relies solely on the representations of its Chinese partners and cannot independently verify that they do not belong to persons executed while incarcerated in Chinese prisons. In 2012, WOIPFG conducted telephone investigation with Sui Hongjin. Sui admitted that some “cadavers” were from Dalian Public Security Bureau. Investigator: Hello, we would like to speak to professor Sui Hongjin. Investigator: I am so-and-so (omitted). Are you professor Sui? Investigator: When Bo Xilai was in charge of Dalian, Von Hagens Plastination Factory was established. You worked there as the general manager, right? Investigator: Please tell us about the relationship between Bo Xilai, his wife Gu Kailai and the Hagens Factory. What kind of relationship do they have? Sui: Because I handled this matter, mainly was thinking that, Hagens was given an award …, Dalian Xinghai Friendship Award. Sui: Hagens happened to be there when the award was being issued… the Friendship Award. Sui: He got the award, and then he was given the award on a ceremony. Sui: Hagens bragged about his intimate relationship with Bo Xilai. Then I left his company. Investigator: We know about this. Sui: Hagens used his relationship with Bo Xilai, the mayor. Sui: and they took a picture together. Investigator: What is the main source of the corpses your company used? Sui: A few dozens were from the Public Security Bureau. That’s it, from the Public Security. Investigator: From the Public Security. How many in total have you gotten from the Public Security Bureau? Sui: I can’t remember now, a few dozen. Sui: If you come in person to investigate, I can tell you about this. It is not very appropriate to talk about this on the phone. Investigator: Which Public Security Bureau provided you (the corpses)? Sui: oh … Dalian city, Dalian Public Security Bureau. Investigator: So the corpses you used were from the Public Security Bureau. Do you know where they got those corpses? Sui: the report was for the Ministry of Public Security. Sui: If necessary, I can talk to you face to face. I can also provide my signature. I will be responsible for my words. Investigator: Which department is directly controlling your company? Is it Dalian Medical University? Sui: Yes. About the Hagens situation, I am more familiar with it than the university. Investigator: Good. Thank you for your cooperation. Investigator: Good. That’s it for now. Goodbye. At that time, the head of Liaoning provincial Political & Legal Affairs Committee and Public Security Bureau was Li Feng  (2001 - 2011 ). Dalian municipal Public Security Bureau was headed by Sun Guangtian  (April 25, 2000 - March 2003) and Zhang Jixian  (September 2004 - December 2009 ). WOIPFG investigations have confirmed that the “fresh cadavers” were neither from “donations” nor from "unclaimed corpses.” Many were from Falun Gong practitioners, who were killed by the Chinese regime. According to Chinese law, if a human corpse remains unclaimed for at least 30 days, it is deemed “unclaimed corpse” and can be used for anatomy studies by medical schools. However, Sui Hongjin’s company has been using fresh human cadavers, i.e., a few hours to two days after death, to make plastinated specimens for exhibition and commercial trade. Those “unclaimed” bodies did not even go through the procedure of identification. Sui’s company has no apparent consent from the deceased or their family members. On Oct. 21, 2003, Hagens wrote in an email: "So far, we haven’t received any donated bodies yet in China ." On Aug. 17, 2012, Gunter Von Hagens’ son told Deutsche Welle that until then they had received one Chinese cadaver . In July 1999, soon after the Jiang Zemin led Chinese regime started to persecute Falun Gong, large number of Falun Gong practitioners were arrested. Prisons and labor camps around China were quickly over-crowded with Falun Gong practitioners. In 2001, the State Council issued “Meeting Minutes on Solving Prison Issues” (State Council  number 73) . In 2002, the CCP started modifying over 700 prisons. (Note: Data on CCP’s construction and expansion of labor camps is not publicly available.) Then Minister of Justice, Zhang Fusen said prisons located in remote areas should be moved to areas closer to city centers and transportation hubs . Liaoning Province acted quickly and in a very large scale. Bo Xilai was the Governor of Liaoning at the time. He personally chaired meetings to discuss plans to upgrade prisons in the province. The plans were then reported to the State Council. The Ministry of Justice clearly indicated that the plans from Liaoning Province should be included in the list of projects of national importance . Eleven months later, in July 2003, the Shenyang City Prison Compound opened. The 400,000 square meter Compound consists of several prisons. The 1 billion yuan project was sponsored by CCP Central and the local government, and claims to be able to hold over 10,000 prisoners . Sui Hongjin  and his German boss Gunther von Hagens’ body factory was located in Gan Jingzi District of Dalian City , which is about 150 kilometers from the Shenyang City Prison Compound. The Falun Gong practitioners from the northeastern provinces and Beijing were transferred to the newly built Shenyang City Prison Compound , where Liaoning No. 1 Prison, Liaoning No. 2 Prison, Xinren Prison and Liaoning Female Prison are located . It is estimated over 2,000 Falun Gong practitioners were held at the Compound. On Feb. 23, 2004, as part of the plan to upgrade prisons in Liaoning Province, Nan Guangling Prison in Dalian City was given 180 million yuan for expansion , and would be combined with Dalian Prison . Nan Guangling Prison was located in the same district as the Hagens Plastination Factory. Three months later, after spending 227 million yuan, Dalian Labor Camp was expanded to 236,700 square meters . Both Nan Guanling Prison and Dalian Labor Camp are notorious for the severe persecution of Falun Gong practitioners . On March 19, 2001, just prior to the International Human Rights Conference, over 400 Falun Gong practitioners illegally detained in Dalian Labor Camp were subject to brutal tortures for three days and three nights . By 2004, according to incomplete statistics, at least 14 Falun Gong practitioners were confirmed, with their real names, tortured to death . However, the so-called law enforcement agencies under CCP control are usually tools for the CCP officials to pursuit individual interests. Since former CCP head Jiang Zemin started the persecution of Falun Gong in 1999, the entire state apparatus, including the law enforcement organs, existed largely for persecution. Law and regulations were destroyed and human cadaver sale and plastination business became rampant. Even the government agencies were actively participating as buyers of plastinated human specimens. The provider, Dalian Medical University Plastination Co., Ltd. was particularly active. Provider: Dalian Medical University Plastination Co., Ltd. Provider: Qingdao Keyi Biotechnology Co., Ltd.
Winning Tenderer: Dalian Hoffen Bio-Technology Co., Ltd.
Tender: Shanghai Dongsong International Trading Co., Ltd. Successful Bidder: Zhengzhou City Hongke Weijiao Trading Co. Ltd. Image 4: "Fetus 10 to 32 weeks" price negotiable, provided by Dalian Medical University Plastination Co. Ltd.
On April 8, 2004, the “Body Worlds” exhibition, which was organized by the Chinese Society for Anatomy and approved by the Ministry of Health and China Association for Science and Technology, officially opened at the Exhibition Hall of China Architectural Culture Center in Beijing. The exhibition displayed 20 full body specimens and over 200 human organ specimens. The full body specimens showed various height and weight, male and female, and were “plastinated” into various postures . The plasinated human vascular system requires the cadaver to be fresh, free of preservatives. The blood vessels must be without damage in order for the fluid to flow freely. The specimen is made by injecting plastination materials into vessels, organs and excreting channels. The body can then be molded into shape. Acids, alkalis or natrual corrosion chemicals are then added. After the organs are removed, the leftover vessels become the specimen . 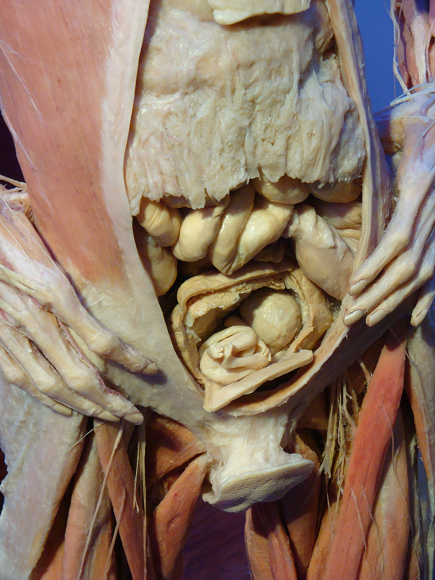 The “Female with Fetus” specimen is a standing female anatomical specimen. The muscle shows pinkish tone. One can clearly see the lungs, heart, ovary and womb, where a three-month old fetus lies. Wang Jian, deputy general manager of Dalian Hoffen said: “The ‘Female with Fetus’ specimen is the only such type in China . According to Chinese law, pregnant women cannot be given the death penalty. Even if the woman died in a car accident, her family would be extremely unlikely to allow their loved ones’ bodies to be made into human specimens. These specimens were all provided by Sui Hongjin and his colleagues at Dalian Medical University Plastination Co., Ltd. These plastinated human bodies have one thing in common, which is that their skin has been completely removed so that “no one can identify them,” Sui Hongjin explained . Under the banner of “science education,” the specimens at the exhibition were priced ranging from tens of thousands yuan to several million yuan, turning the exhibition into a trade show . The admission fee was 50 yuan for adults and 25 yuan for students . On Jan. 22, 2004, while in Frankfurt Von Hagens told Deutsche Welle, “In the making of human specimen, we never use corpses of executed prisoners .” However, Hagens never denied using corpses of Chinese people to make human specimen. 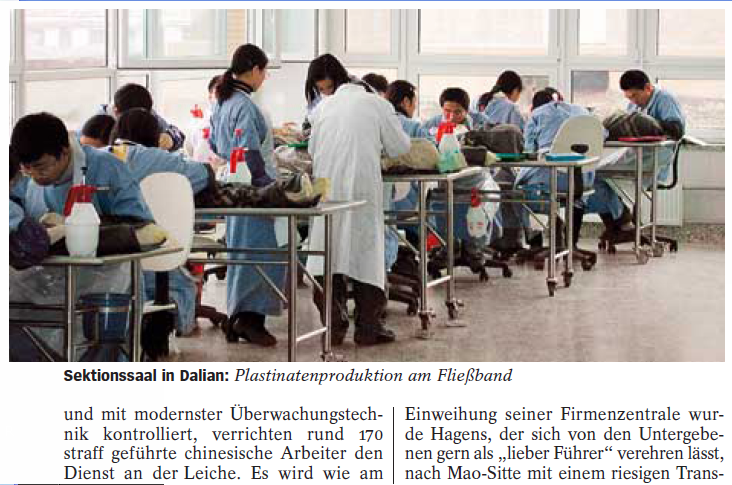 In order to “refute” Der Spiegel’s accusation (in its Jan. 19, 2004 report) of him using the corpses of Chinese prisoners, Hagens “immediately ordered his Dalian plastination factory workers to check the 650 cadavers for gunshot wounds . That is to say, if none of the 650 cadavers were Chinese, then there is no need to check for gunshot wounds. It turned out that “7 cadavers had head injuries . This suggests that the 7 people may have been executed prisoners.On Oct. 21, 2003, Von Hagens said that he could not “get any donated bodies in China.” This suggests that the 7 cadavers with head wounds may have been executed prisoners. Then who were the rest 643 Chinese bodies? Before its production halt in 2006, Von Hagens Plastination (Dalian) Co., Ltd. reported an annual income of 131.69 million yuan, and 714.66 million yuan in total assets. The address of the company was 27 Qixianling Gaoneng Street, Hi-tech Zone, Ganjingzi District, Dalian City, Liaoning Province . From 2004 to 2012, Sui Hongjin’s human body exhibitions appeared in over 60 cities and over 20 countries. Exactly how many Chinese bodies had been plastinated and sold to the U.S. and European countries by Sui Hongjin? Given the current situation in mainland China, it is still difficult to even come up with an estimate. Sui Hongjin’s BODIES--The Exhibition has become a major source of revenue for Premier Exhibitions. In Las Vegas, New York and Atlanta, where Premier Exhibitions headquarter is, BODIES has been on permanent display charging over $20 dollars per ticket . The official website of BODIES - The Exhibition claims that “BODIES has been experienced by more than 15 million people worldwide .” A Southern Metropolis reporter checked the annual report of Premiere Exhibitions. The 2009 10-k form indicates 19 percent of the company's revenue came from Titanic and 67 percent of the revenue came from BODIES – The Exhibition. During the six-month exhibition in Dublin, THB exhibitions were also held in other European countries. From June 16 to September 9, 2012, The Human Body was in Ostend - Flanders, Belgium . According to an Aug. 23, 2012 article on Southern Metropolis Daily, there are several dozens of human body plastination factories in China. Among those, the Von Hagens factory and Sui Hongjin’s Dalian Hoffen are the largest and both are located in Dalian City. According to Sui Hongjin, the rest of the factories amount to only 10 percent of the business . In January 1994 when Bo Xilai was the mayor of Dalian City, Liaoning Province, Sui Hongjin, a teacher at Dalian Medical University, was sent to Germany to study plastination under Gunther von Hagens. Sui Hongjin played a key role in establishing the collaboration between Hagens and Dalian Medical University. In December 1996, Hagens founded Hagens Institute of Plastination in Dalian, the first such institute in China . Sui Hongjin was appointed the director of Hagens Institute of Plastination . 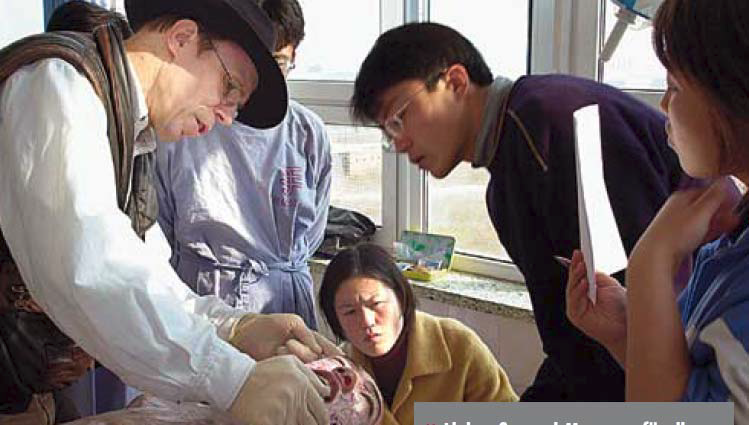 In August 1999, one month after the CCP launched the persecution against Falun Gong, Dalian municipal government approved Hagens to invest 15 million dollars in a solely foreign-owned enterprise, Von Hagens Plastination Ltd., in Dalian Hi-tech Zone . (Foreign Investment Approval Certificate: Foreign Trade and Economic Cooperation  No. 0298. Business license registration number: solely foreign-owned enterprises  No. 07598) . Sui Hongjin was appointed General Manager . In December 2000, as an exception to the usual promotion rule, Sui Hongjin was appointed to professor and director of Anatomy Department at Dalian Medical University . In July 2002, Dalian municipal government awarded Von Hagens Plastination Ltd. the title of “Hi-tech Enterprise” based on its allegedly advanced plastination technology . At that time, Bo Xilai was promoted to the Governor of Liaoning Province , the mayor of Dalian was Xia Deren . In 2000, the Ministry of Health and Chinese Association of Science and Technology approved Sun Hongjin’s application to hold China’s first plastinated human body exhibition, “The Body World Exhibit,” scheduled in 2004 . According to Dalian Hoffen Bio-Technique Co., Ltd.’s explanation, “In order to develop China's own plastination technology ,” on June 21, 2002, with the support of Dalian Medical University, Sui Hongjin established his own business . Without notifying Hagens, Sui registered an university-owned enterprise, Dalian Medical University Plastination Co. Ltd. 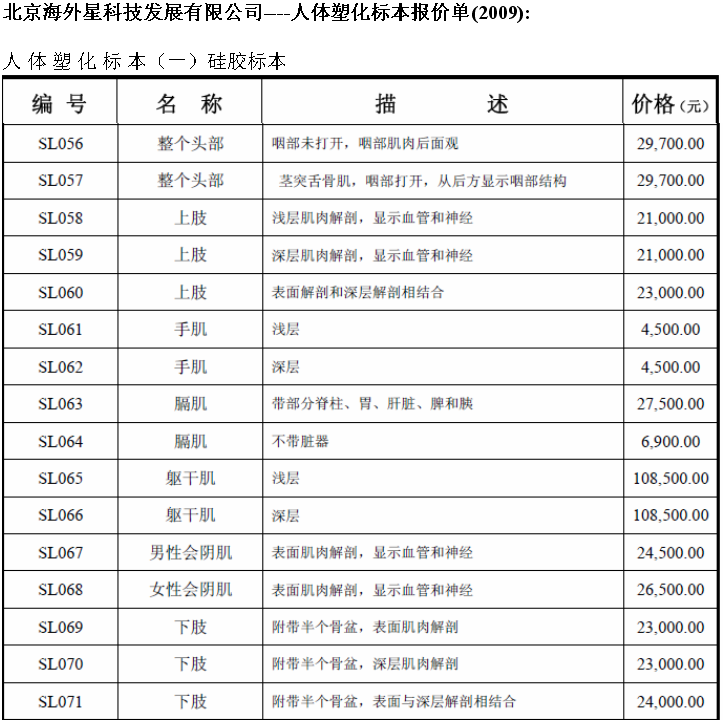 The registered investment was 1 million yuan . When Hagens eventually found out about Sui Hongjin’s own plastination company, Hagens fired his general manager, Sui Hongjin . In January 2004, Sui Hongjin expanded his operation and established Dalian Hoffen Bio-Technique Co., Ltd. and served as Chairman of the Board . The company was locat106ed in Dalian Hi-tech Zone . It enjoyed the Dalian municipal tax break . During the preparation for the “Body World” exhibition, Sui Hongjin was sent to Austria, Australia, Spain and other countries to participate in international Symposiums on plastination. 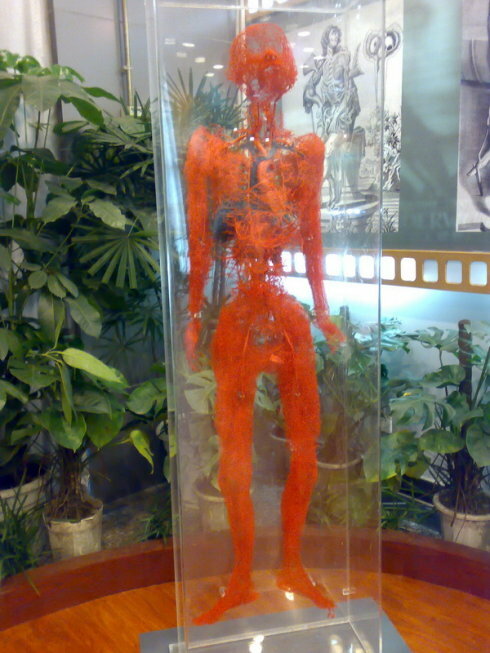 On Jan 1, 2004, the “Plastinated Human Body” exhibition provided by the Dalian Medical University  quietly opened at the Museum of Natural History in Beijing. The exhibition included six full body specimens and nearly 200 organ specimens. It was not well received by the populace and was commonly called the “corpse exhibition.” Even the media, controlled by the Central Propaganda Department and only allowed to “speak with one voice”, published different opinions about the exhibition. Qiu Zongren, an expert in bioethics, told Beijing Morning Post that even for a human cadaver, because it carried a life before, thus it has dignity and deserves respect. Any commercial activities involving cadavers are considered disrespectful for life. Chen Tianmin, another expert in bioethics also pointed out that Chinese people couldn’t accept such an inhumane practice, and such blatant commercialization of cadavers is against ethics. On Jan 9, Beijing Morning Post published these interviews entitled “Controversy Incited by the Human Corpse Exhibition; Experts Say that Cadaver Deserves Dignity” . On April 8, 2004, amidst wide spread controversies, the “Plastinated Human Body” exhibition was held at the China Architectural Culture Center. Sui Hongjin, deputy director of the Department of Anatomy and his assistants at Dalian Medical University provided over 20 plastinated human cadavers and over 200 plastinated human body parts. Comparing to the previous low profile exhibition in the Museum of Natural History, this time was the opposite and a 4-month tour around the country was announced with Beijing as the first stop. The exhibition was jointly sponsored by Chinese Anatomy Association, Dalian Hoffen and Beijing Zhonghai Shangda Advertising Co., Ltd. . Beijing Zhonghai Shangda Advertising Co., Ltd. is affiliated with the Propaganda Department of the Shanghai municipal Party Committee. “The publicity of the exhibition was very high profile. Such publicity included a press conference prior to the official opening, large amount of outdoor advertising, pamphlets and large images in many subway stations. The image was a skinned human cadaver proudly standing with his hands holding his own skin . Beijing Qianlong News special contributors Ren Wei and Zhang Yongyi wrote, “They put human corpses on display and charge people money for it. Whatever they say the purpose is, education or art or making money, these are merely excuses. Many people can’t accept this kind of 'science education'” . China High-tech Industry Herald, affiliated with the Ministry of Science and Technology, reported that Dalian Hoffen Biological Co., Ltd. was able to eliminate the controversy with help from the Ministry of Health and the Central Propaganda Department . On June 11, 2004, Dalian Hoffen’s “Body World” exhibition began in Korea. On Aug 8, 2005, Sui Hongjin’s plastinated human specimens landed in the United States . The “Provisions on the Administration of Entry and Exit of Cadavers and Treatment of Cadavers” took effect on Aug. 1, 2006. Article 8 strictly prohibit trading of cadavers and commercial activities using cadavers . Von Hagens’ son Rurik von Hagens told Deutsche Welle, “In 2006, Beijing government issued a ban on export and import of plastinated human bodies. Since 2006, we stopped making plastinated bodies in China .” In 2007, Hagens stopped production in China . However, the “Regulation” is only effective in banning Hagens, but not Sui Hongjin. Since the “Regulation,” Sui Hongjin’s domestic business of making plastinated human bodies thrived. According to a report by Dalian Television Station on Nov. 23, 2010, Dalian Hoffen has business dealings with over 100 famous museums around the world, and Dalian Hoffen’s annual income has reached $200 million dollars . As previously mentioned, given the current situation in mainland China, it is still difficult to even come up with an estimation.On Nov. 28, 2007, the China Anatomy Association announced that with the approval from the Ministry of Health, the Association and Sui Hongjin will prepare a “human body science world tour.” Based on the experiences from touring Beijing, Hefei and Nanjing, the Association expects to make the world tour high quality . On Dec. 15, 2008, Dalian Hoffen was awarded the title of “High-tech Enterprise” (Award Certificate No. GR200821200070) by Dalian municipal government. With this title, Dalian Hoffen enjoys tax benefits . On May 15, 2009, Dalian Hoffen opened its “Mystery of Life Museum” claiming to be “the only comprehensive museum to explore human life in the world .” The museum takes up 3,000 square meters of space. Sui Hongjin said, “The construction of the museum has received generous financial aids from Ministry of Finance and China Association for Science and Technology. We have also received a lot of attention and care from other ministries and officials from different levels, including Wu Jieping, Zhong Shizhen, Xue Shepu from China Academy of Sciences, Zuo Huanshen from Shanghai, Zhao Jinze, Zhang Chengyin, Teng Weiping from Liaoniang Province, Li Wancai, Wang Ping, Qu Xiaofei from Dalian municipal government . On April 7, 2011, Dalian Hoffen provided 310 plastinated human bodies and parts to be on exhibit in Beijing National Meeting Center . Sui Hongjin received the “Technology Advancement Award” from Liaoning Provincial Education Committee in 1997. In 1998, Sui received the “Technology Advancement Award” from Ministry of Education. In 1999, Sui was the “Star Inventor” of Dalian City. In 2000, Sui was selected as “100 promising people” by Liaoning Provincial Department of Personnel. In 2001, Sui won second place in the 3rd Liaoning Province Youth Science & Technology Award. In 2002, Sui was titled “advanced inventor” of Dalian City and “advanced educator” of Dalian Medical University. In 2004, Sui won 3rd place in Liaoning Province Science & Technology Award and was praised for "making an outstanding contribution to our nation’s plastination industry” . In 2004, Science Times under Chinese Academy of Sciences  selected Sui Hongjin as one of the “10 public figures in science education” and the “boldest” science educator. Evidence strongly suggests that the human cadavers used for plastination were not from donation, nor from unclaimed corpses. Yet the main sources of the cadavers may not be the “executed prisoners” as people have been speculating. In mainland China, the thriving “human body plastination” industry may have relied on the Chinese regime’s persecution of Falun Gong, and the main source of the “fresh cadavers” may be Falun Gong practitioners who were arrested and refused to reveal their identities. Such inhumane crimes against humanity are impossible in a normal society, but are possible under the CCP, as China is turned into the largest human body plastination factory in the world. 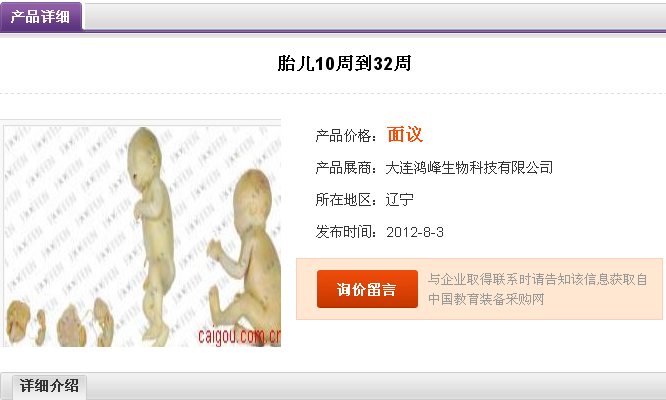 “China Economic Survey List of Enterprises” Dalian Medical University Plastination Co. Ltd.
 “cd.qq.com”, December 18, 2007, “Pregnant Mummy Displayed in Chengdu” Source: Sichuan News Net - Chengdu Evening News reporter, Zhang Wenting and Han Jie. Q: Where do the specimens come from? A: All of the bodies were obtained through the Dalian Medical University Plastination Laboratories in the People’s Republic of China. Asia possesses the largest and most highly competent group of dissectors in the world, and they are highly skilled in preparing the bodies for educational and scientific purposes. Currently, human specimens in medical schools in China, the United States and other countries throughout the world are donated or unidentified bodies. Q: Who organized and designed THE HUMAN BODY EXHIBITION? 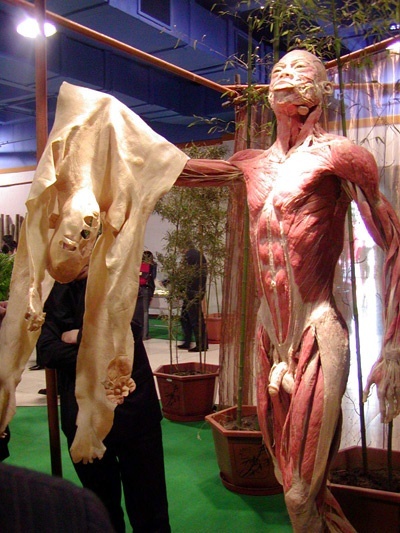 A: THE HUMAN BODY EXHIBITION is produced by HK Exhibition Group and not affiliated with any other organizers of human anatomy exhibitions, including Gunther von Hagens, Gerhard Perner, or Genlife Biomedical.